The joint efforts of all the Clubgolf Coaches Jim Frail, Liz Morgan, Ashley Rose, who are all Level 1 Advanced coaches, together with the many helpers who have all attended First Aid Training, PVG Checks and Safeguarding & Protecting Children Courses, Callander Golf Club’s Junior Section is thriving. If you haven’t played Golf before or are already an accomplished player then we would welcome you to our Club. We welcome all Juniors aged 5 – 12 to participate in our Clubgolf Lessons where they are nurtured by coaches, parents and fellow members alike, we believe in teamwork and making Golf fun! Individual Lessons are available for all Juniors aged 13 – 17 where they will learn the finer points to enable them to achieve a handicap and start to play competitively - should they wish to. During the playing Season April – October weekly Junior Medal, played over 18 holes, are held for Juniors aged 12-17 years and the Under 12’s Medals, played over 6 holes, are held every two weeks. The basics of Golf including early rules and etiquette are important aspects of the game that we install into our young players. The emphasis is on taking part rather than the competitive side of things until they are 12 years old. Any of our young boys can take part in Gents Medals once they attain a handicap of 9 and our young Ladies can take part in our Ladies Medals when they acquire a handicap of 36. Callander has a relaxed environment for Juniors to enjoy their Golf - It's a great place to learn to play Golf or to enhance your skills. What Callander Golf Club can offer Junior Members? Parent & Child Membership starting at £150, allowing Juniors to play with a Parent to help practice, learn and enjoy the game. 11:00 a.m. – 3:00 p.m. Monday – Thursday with Friday starting at 3:00 for a Special Competition and Prize-giving. Junior Blue Flag Day – Junior Members from other Golf Clubs to come and play, prizes to be won!! 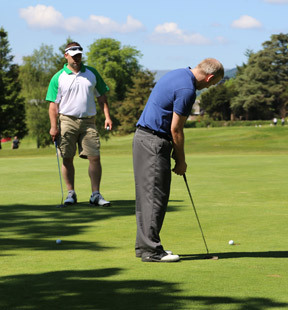 Days out to Professional Golfing events, Bowling Days, Fund Raising Events. Parents can play their part too, we encourage them to walk around with their youngsters marking scorecards on Medal Days and letting the Juniors show how much they are improving. A friendly Club with a relaxed atmosphere that will make you very welcome.